The Dubliner could also claim at least a bronze by finishing in the top five on Tuesday. Annalise Murphy is currently third ahead of the medal race. IT’S BEEN CONFIRMED that Annalise Murphy will receive a bronze medal if the weather once again forces sailing to be cancelled tomorrow. Murphy faced a frustrating few hours in Rio earlier, as the conditions wreaked havoc on proceedings, ultimately forcing organisers to postpone the medal race until tomorrow. Should the same situation occur again over the next 24 hours, sailing administrators will be left with no choice but to cancel the medal race completely. Should that happen, the Dubliner would win a medal by default, as she currently finds herself in the bronze medal position. If the sailing goes ahead, Murphy can guarantee herself bronze at least with a top-five finish. Belgium’s Evi van Acker, who is currently fourth and pipped Murphy to a bronze medal at London 2012, needs to finish at least five places ahead of the Irish athlete to overtake her into third. Meanwhile, Murphy could claim silver by finishing ahead of Denmark’s Anne-Marie Rindom, who is currently second, and ensuring she is not five places or more behind Van Acker. Alternatively, she could still win silver if she loses to Rindom, but finishes five places ahead of Holland’s Marit Bouwmeester, who is currently in first place. A gold medal is also a possibility, if Murphy finishes five places above Bouwmeester, in addition to beating Rindom. 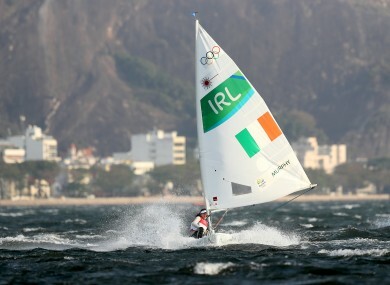 Weather permitting, tomorrow’s medal race is due to get underway at 5pm Irish time. Email “Annalise Murphy will be guaranteed a medal if the sailing is cancelled again tomorrow”. Feedback on “Annalise Murphy will be guaranteed a medal if the sailing is cancelled again tomorrow”.